THREAD TEMPLE AMIDST THE BUSY ROADS OF SURAT. It is with this hope that the circular migrants’ settlement on the developing BRTC track of Surat, keep coming back, bringing along with them their cultures. 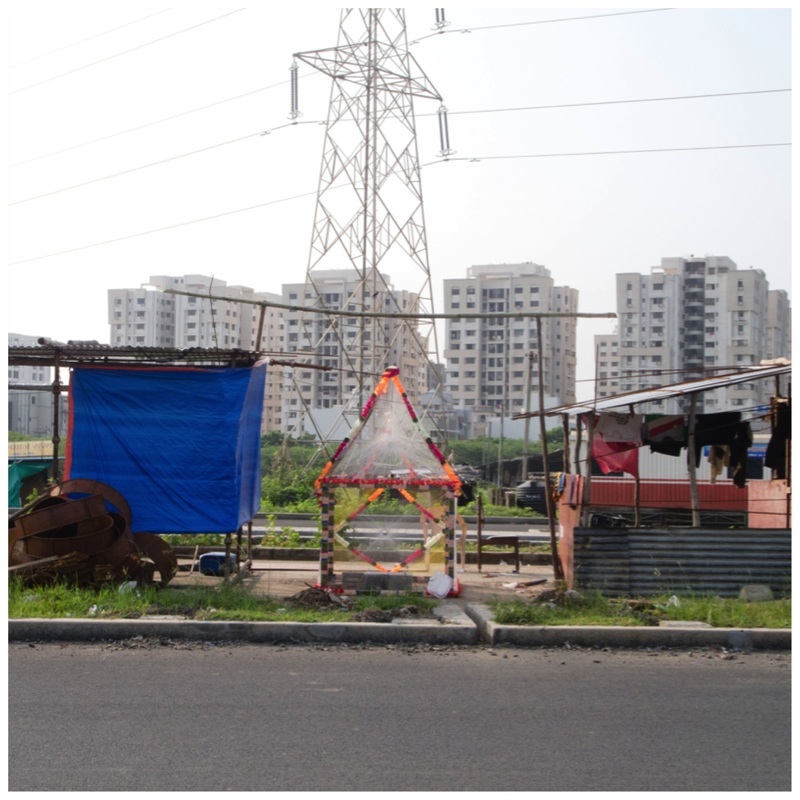 A beautiful display of which was witnessed amidst one of the busy roads of Surat, where some of these migrants, from Kolkata, who are into road construction,had built a temporary temple of threads to celebrate Vishvakarma day, on the 18th of September, 2014. 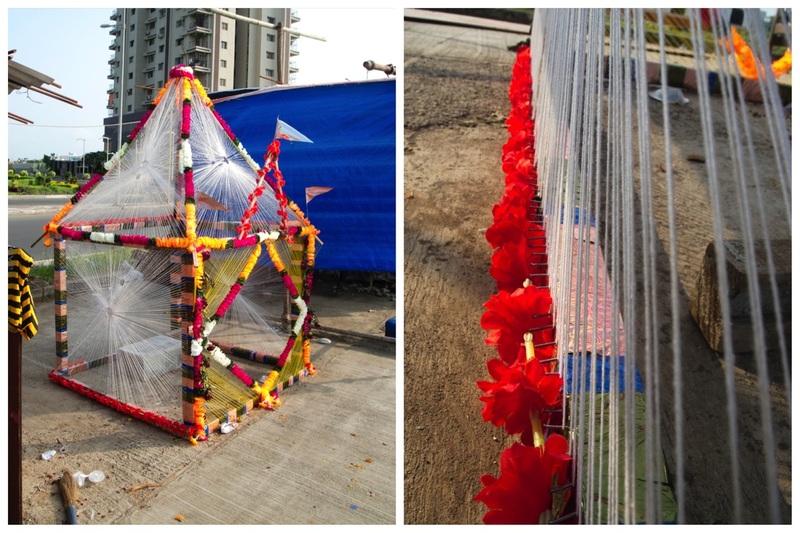 A simple cotton thread can be woven to form a piece of cloth, but here these migrant laborers had used it to create a beautiful temple of some 7 feet high, to ﻿﻿honor﻿﻿ their god Vishvakarma. Vishvakarma is a Hindu god, who is considered to be the divine architect, who have constructed many architectural marvels and fabulous weapons for the gods. On this day all artisans, craftsmen, mechanics, smiths, welders, industrial and factory workers worship the god for a better future, safe working conditions and success. They worship the idol of the god, along with the worship of their tools. A priest is called in, to conduct the ceremonial prayers followed by the visarjan (letting go of the image of the deity in running water) of the image in the river Tapi. The temple took some two days to complete and was constructed by the group effort of all workers residing in that particular area. These workers have been here since last two years, with occasional visit back home for holidays. The workers who made this temple are from Kolkata and say that they have been into making this kind of temples since long. They have not been trained but they have learnt it over years by seeing fellow workers make it. Their material choice varies every time. This time they used threads, with a bangle being the centre for all the sides. It is from the bangle that the thread seems to radiate out to the number of nails pinned in the wooden structure erected in the form of a temple. They had also used artificial flowers to aesthetically decorate the visible wooden columns. After the worship this temporary abode is left abandoned. An art of a state 1,500 km away, has travelled Surat,all the way with these migrants, who are not only helping in petty jobs but also enriching Surat with the culture they bring in.Seeing this temple is an amazing experience and it makes you wonder that how creative these workers who have no formal training can be. When I speak of Indian Society, then, I speak of all this. Society is what will unite us collectively and take us into the future yet keep us in close contact with our roots, our history, our tradition, our heritage. Societal culture will let us take a quantum leap and land on the moon bur first, before all that, it must help us take a few small steps towards understanding ourselves better, towards knowing each other better and help us to create harmonious civilization. Civilization must once again remind us to be a tolerant and truly secular people. And whose society is it anyway? Yours? Mine? Theirs? There are so many ‘theirs’ in the land of our birth who have nothing but the harsh landscape of surviving from day to day. These dispossessed remain with us after six decades of becoming possessed of a freedom we all fought for. In other words, they all fought for. I have always believed that the real history is made by ordinary people. I constantly come across the reappearance, in various forms, of folklore, ballads, myths and legends, carried by ordinary people across generations. The reason and inspiration for my photography are those people who are ordinary and subjugated, and yet do not accept defeat. For me, the endless source of ingredients for photography is in these amazingly, noble, suffering human beings. Why should I look for my raw material elsewhere, once I have started knowing them? Sometimes it seems to me that my photography is really their doing.